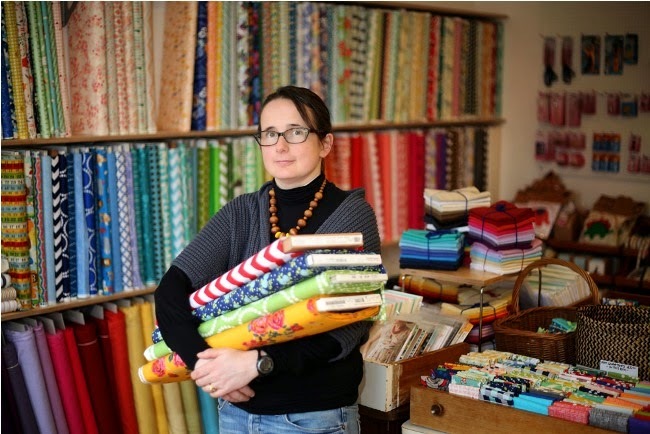 It's time for another dose of fly-on-the-wall fun as we go behind the scenes of lovely sewing businesses. 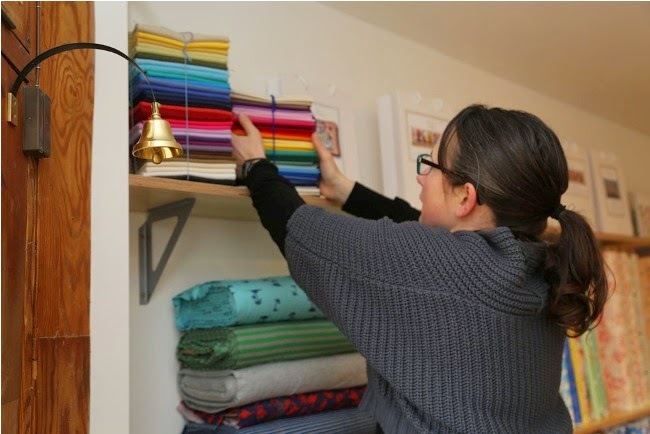 For this month's A Day in the Life, Alice Synge tells us all about what she gets up to running her gorgeous Cambridge haberdashery Backstitch, as well as how she got started. Guess what time she gets out of bed? "Hello everyone! First off I’d like to thank Tilly for including me in the Day in a Life series and giving me the ‘Miss September’ spot. My days vary as I work in the shop some days and at home others, but let’s look at a shop day as that’s where the action happens! I’m a reliably bad sleeper so I usually wake between 5.30 and 6.30am. I creep downstairs in my pyjamas and brew strong coffee as quietly as I can. I have an office at home that I sneak into and will spend an hour or two on business paperwork and emails until the rest of the house wakes. Once my husband and two boys (aged 4 and 7) are stirring I then emerge from the office and get involved in the usual family breakfast dramas of mopping up spilt milk, cutting fruit and answering questions about time and space. The shop doesn’t open until 10am so during term time I have the privilege of walking my boys to school which I really love – the youngest is starting proper school this September. It’s amazing how much important bonding chat we have in those ten minutes every day, that’s if they are not racing ahead, and I am glad that I can give the kids, and myself, the stability and reassurance of seeing them into their classrooms. We live in a village 15 miles from Cambridge and after the school run I make my way to the shop which is a twenty minute drive. 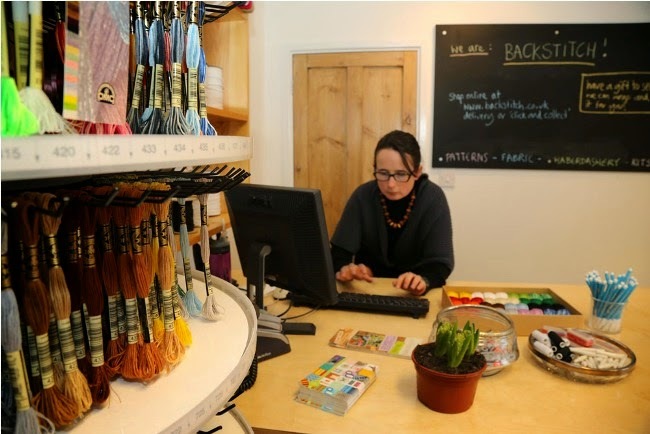 The shop is located on a gorgeous farm complex of 15 retail units called Burwash Manor Barns just outside Cambridge and just off the M11 and it really is a lovely place to be. We have the benefit of free and ample parking and a great community spirit. I love being on site, all the shops look out for each other and there is a lot of popping in and out of each other’s units. I spend a lot of my time trying not to spend too much money in these other shops! Backstitch is a bright and airy space with a lovely outlook and I still get a thrill opening up and getting the lights on and music going. 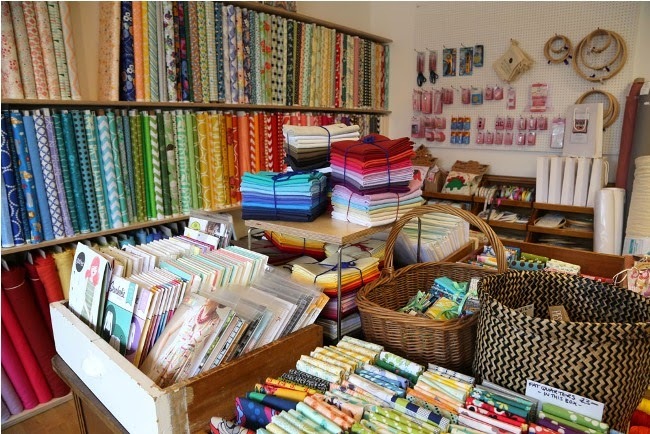 If we have a morning class I quickly get absorbed in talking to the students and making tea – the atmosphere when the shop is full of people sewing is the best. Once all is underway then I get stuck into the days tasks. The daily jobs are varied in the shop and I enjoy my customer-facing days. 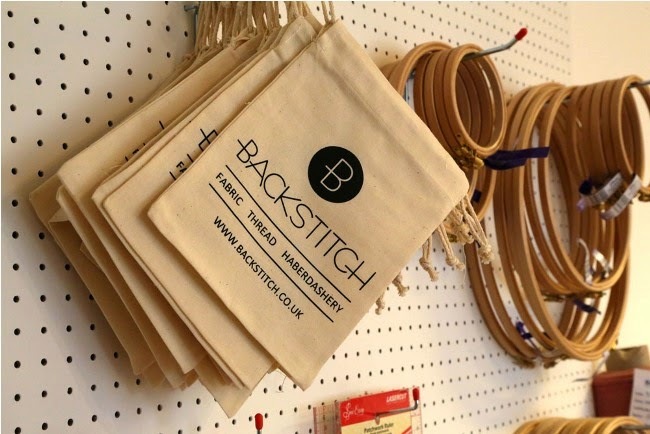 It is so important that I remain the face of Backstitch and in touch with my customers – and I love to do it! As well as serving in the shop we fulfil internet orders, answer customer enquiries, restock our basic ranges and keep the shop looking fresh and tidy. 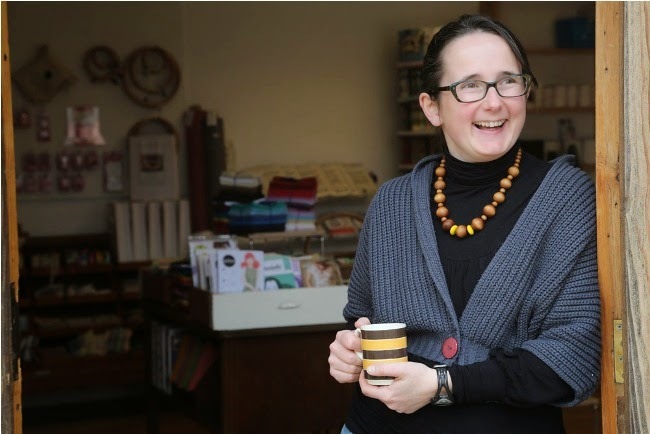 I also use shop time to have meetings with suppliers and spend time choosing new ranges – our stock is constantly expanding and I’m always looking for new lines that will fit in at Backstitch and make my customers happy. At about one o’clock I stop for lunch. I always sit down at our big workshop table and if there is more than one of us working we’ll eat together – sometimes I’m lucky enough to have friends join me for lunch in the shop too! I usually have a salad or leftovers (leftover lunches are my favourite) or I may hop over to the deli on site and grab a sandwich or some other delicious lunchy thing from their counter. Afternoons are often more busy with customers than mornings, but if I have time I will crack on with work on my laptop – I might write a blog post, photograph some new products or work on our class schedule. I always seem to have about a million things going on at once so I have to be quite strict with myself about keeping focused! I began Backstitch about four and a half years ago. I was working from home at the time and had been searching for ‘The Business Idea’ for a while. I finally decided to start selling fabric online and got going on a limited budget from my home office. I haven’t looked back and eventually gave up my day job a year ago and then 6 months after that, in March, I moved Backstitch out of my home and into the retail premises. The business has changed so rapidly in the last year and I’m really proud of how far it has come but the changes in my daily life have also been huge. I had been working from home, for myself and for others, for the previous seven years and had become a bit of a hermit – I’m still getting used to being back out in the big bad world! I have a number of grand plans for the business and have many pots bubbling away in the back of my mind... All top secret of course!! I love being self employed, and it has always been something I wanted to do, but it is fantastically difficult. Some of the imagined benefits of working for yourself are not having a boss breathing down your neck and being able to take time off whenever you like, but in reality I am the toughest boss I have ever had – very hard to please and a total slave driver! But it is rewarding work. 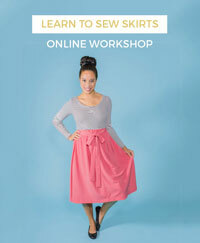 I love being in the shop and talking to our customers about what they are making, and enthusing them to sew. The most amazing thing is facilitating people’s creativity – the palpable pleasure exuding from someone who has made their first project is priceless. Backstitch shuts at 5pm, and if I’m going into Cambridge for an exercise class then I hang back and work on, but otherwise I try and get out pretty sharpish. I love to be active but struggle with finding the time to do everything that fulfils me and I’m carrying a couple of injuries at the moment too. Currently I try and regularly involve myself in swimming, running, capoeira (a Brazilian martial art) and yoga. On the evenings I’m at home I spend a couple of hours with the kids before dunking them in the bath and reading stories. My husband and I eat with the boys when we’re eating family favourites like pasta, but our love of spicy food wins over fairly often and then we will eat our food later – favourites are roast vegetables with hummus (my husband makes a mean hummus), curry or ratatouille with sausages. We are guilty of eating these later meals on the sofa in front of the TV – especially as it’s getting cooler now and we like to light our wood burner in the front room. After dinner I usually get my laptop back out and carry on working. I’m trying to get better at relaxing in the evening, but the work is never done, so it is a bit of a battle! I tend to get to bed by about 10pm and spend a short while reading my book before my eyes give up on me. I like to read fairly low-brow novels and have the ability to read, and enjoy, book after book without retaining any information such as the book title or author. So I can’t tell you what I’m reading right now, it’s some period drama with peerage tussles and scandal, it’s certainly ticking the escapism box!" Aw Alice, you've created such a wonderful business... thanks for sharing your day with us! 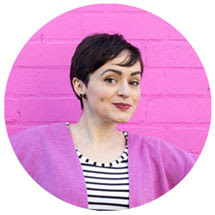 Readers, be sure to check out the lovely things Alice has in stock at Backstitch, and if you enjoyed this post you can read more Day in the Life interviews.